USB60F is a USB to serial converter. Standard USB (A type Male) connector. 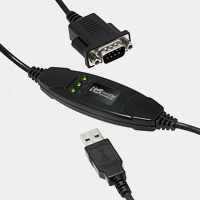 Equipped with the USB Std.A type Male connector that can be connected directly to the USB port of PC. Power supply for USB60F use the bus power from the USB port.